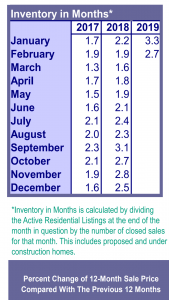 There were 2,444 New Listings in February 2019 which was down 3.4% from February of 2018’s 2,530, and also down a whopping 19.8% from the previous month/January’s total of 3,048. ***This was the coolest February since 2014 when the New Listings in Feb were 2,354. At 1,726 February 2019’s Closed Sales were mixed. They cooled 4.4% from February 2018’s 1,806, BUT, rose a substantial 19.0 % from the previous month/Jan 2019’s total of 1,451. February 2019’s Pending Sales (accepted offers), at 2,208 were also mixed: Down 5.5% down from February of 2018’s 2,337, AND, ahead 8.0% from the previous month/Jan 2019’s total of 2,045. The Average Sale Price in February 2019 of $441,100 was basically unchanged/down just slightly ($800.00!) from last year/February 2018’s $441,900, and up from the previous month/Jan 2019’s $435,600 by $5,500. The “Median” Sale Price (so…the price smack dab in the middle of all sales) in February 2019 of $399,900 was up $14,900.00 from last year/February 2018’s $385,000, and also up about the same, $15,000, from the previous month/Jan 2019’s $384,900.